We married when we were both 35 years old. Somehow, it seemed right that we marry in a church, even though neither of us had been to church for a number of years. We continued to attend church off and on in Houston, Texas, until we changed churches and started attending Bethany Christian Church around 7 years later. Our new church community drew us in and we began attending more regularly. Glenn's dream was to retire at age 55. Fortunately for both of us, we had spent and saved wisely enough to be able to afford to do that. From Houston, we made the move to Austin, Texas, and lived there for 5 years. It took us awhile, but we settled on United Christian Church, not too far from our home. Again, we found a wonderful community. During those 5 years in Austin, we enjoyed a lot of traveling (from California to Nova Scotia; from Banff to Quito). On a trip returning from a visit with Marilyn's mother in California, Marilyn mentioned to Glenn that she would like to be a missionary some place. Since he loved to travel, he was ready to go, although not as keen to volunteer as Marilyn. 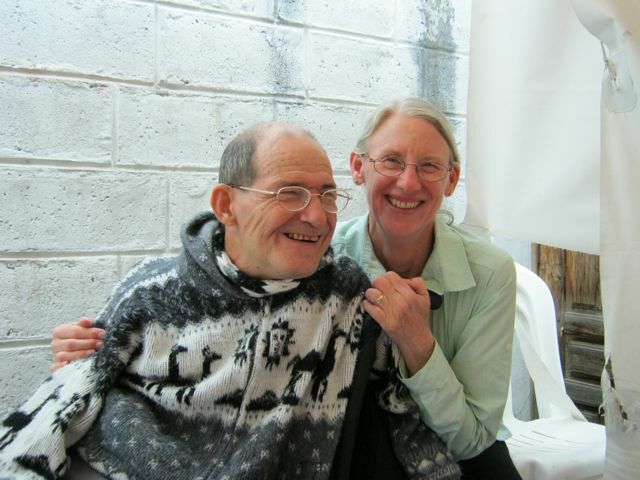 We moved ourselves, first to a hotel for a year in Otavalo, Ecuador, and then to a house in the area. Glenn writes for and maintains this blog about our experiences and does more "honey-do" things for Marilyn than he probably wishes to do. Marilyn teaches English classes in a number of preschools in the nearby communities. Her background is in physical education/dance and grant writing. She finds it odd that she's now teaching an academic subject in a classroom. Marilyn still struggles with her ability to understand Spanish, although she is not too bad at expressing herself in the language. Glenn has been a geologist and computer programmer. During his breach birth, Glenn's mother had much difficulty in his delivery which caused him brain damage, resulting in Glenn having pretty significant cerebral palsy that affects both his speech and his motor movements. In spite of his disabilities, he worked for an oil company for over 25 years using his programmer skills and his knowledge of geology. Launching into life, Glenn has not let his disabilities keep him from participating in numerous activities, including being dragged to Ecuador. We both hope you enjoy reading about our experiences. I always enjoy reading about your adventures and accomplishments. You two amaze and inspire. Your look great in your picture. I love you guys!!! I am truly in awe of your dedication and perseverance. I have to admit that I am jealous. I wish I had the nerve to do what you have done. Keep up the good/vital/worthwhile work!!! We think about you two and hope to visit with you. Hope you are doing well. Your blog was instant inspiration! My partner and i are looking for an opportunity to serve when she retires in a few months. My being wheelchair bound made me fearful we might not be able to do that anywhere but the states. Also, neither of us knows Spanish...yet! Your post gave me hope that we might find a way! Bless you in your service and in every way possible. Thank you, Sherry. We hope you two are able to find a meaningful volunteer experience. I love this picture. I miss your smiling faces and zest for life! We miss you, too, Doris. We should be back for parts of April and May. I typed in Caluqui on google to see what would come up. What a pleasant surprise to have found THE blog haha. Missing Ecuador and everyone in it already. Hope you guys are enjoying your holiday travels! Hey, Melissa. We're in Sacramento visiting Marilyn's family right now. It was really funny running into you the night before we all flew back to the states. We'll go back January 9th. When you manage to make it back, contact us, by all means. Headed your way later this week. Can't wait to see you two! Just love hearing about your adventures and love living vicariously through your faith and courage. Virtual hugs till we get to deliver real ones. What day are you coming?